We make inaccessible and unusable websites and apps all the time, but it’s not for lack of skill or talent. It’s just a case of doing things the wrong way. We try to build the best experiences we can, but we only make them for ourselves and for people like us. 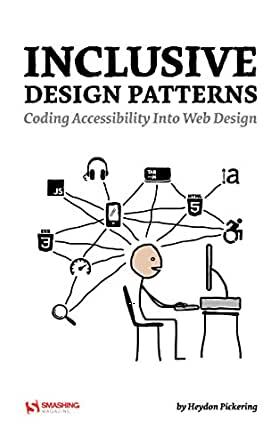 This book looks at common interface patterns from the perspective of an inclusive designer—someone trained in building experiences that cater to the huge diversity of abilities, preferences and circumstances out there. •How to prototype with accessibility in mind. While not necessarily an index of all accessibility best practices (not sure if one even exists), this book gives web developers, web designers, and business units context around what digital accessibility is and why it is important. There are helpful examples throughout. I've used information in this book to give teams an introduction to Accessibility and Inclusive Design. I recommend this book for all web designers and developers who want to get a leg up in their careers and prepare for a future in which governments get more strict about these requirements. If you've never considered how people who use screen readers or assistive technologies experience the websites you build, this is a MUST READ. Understanding the context and need for inclusive design is the first step. The more you can learn about inclusive design and development, the more valuable your skills will be. This book can also help you make a case for why your organization should start a practice of inclusive design. I read this book over a long weekend. This is not an end-all be-all "do this and your web site will be accessible" instruction book. Rather, it is a book to train you how to think inclusively. I think it is good for web developers (and possibly designers) who want to ensure their pages and interactive components are accessible. The author goes through several different examples that can be added to any web site (I implemented some on my blog): What should go in a document, a paragraph, a blog post, a menu button, a list of products, a filter widget, and a registration form. As the author goes through examples, he discusses how different choices can affect blind and keyboard users, and those discussions can really be applied to any web page in any situation. My favorite quote from the book goes something like, "Everybody is a keyboard user when they are eating with their mouse hand."